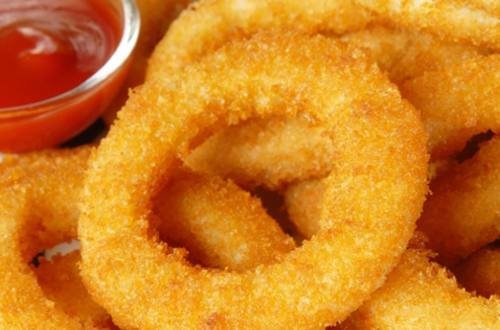 This Onion Rings recipe is so easy to make. Use Knorr Liquid Seasoning to make the perfect merienda or side dish at home. 1 First, prepare 3 trays with the flour, egg and breadcrumbs mix. Dip the onion slices in flour first, then in egg, and lastly in the breadcrumbs. Repeat with the rest of the rings. 2 Next, Pre-heat oil then deep-fry breaded onions until brown and crisp. Toss with the seasoning mix and serve right away. 3 For the dip: Combine mayonnaise, garlic, and Knorr Liquid Seasoning and mix until smooth. Over game board nights , movie marathon at home or simply entertaining guest. Onion Rings will never fail to put a smile on your face.